The Bartang Valley is located in the middle of the Pamirs, a mountain range in the heart of Central Asis that stretches over swaths of Tajikistan, Afghanistan and easternmost China. Whereas the neighbouring Hindu Kush has rather made unfavourable headlines during the last years, and whereas the Himalayas are about to get smothered by mass tourism, just few people know this marvel in the immediate neighbourhood. 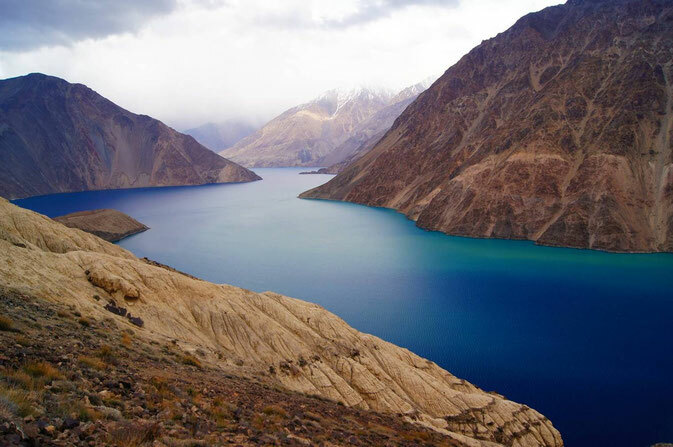 This is a pity, as the Pamirs come up with manifold geographical superlatives: the highest summit of the former Soviet Union, the longest extra-polar glacier and the barrier lake with the most massive natural dam in the world. For many endangered animals such as the gigantic Marco-Polo-Sheep (renowned for its horns of up to 1,40 m width) as well as the snow leopard, the Pamirs form one of the last refuges. Geologists use to know the Pamirs as one of the few sources for Lapislazuli, which for millennia has been the only one known to the world, and for the top-class spinels some of which adorn the English crown jewels. To friends of history the Pamirs are known as the setting of the so-called Great Game in the 19th century, the colonial competition between the British and the Russian Tsarist Empire for the last white blanks on the map of Asia. Finally, Cultural Anthropologists and Linguists appreciate the Pamirs because of their great cultural and linguistic diversity: In nearly every valley, a distinct language or dialect is spoken, so that many inhabitants of neighbouring valleys cannot understand each other in their native tongue. And many of the ages-old traditions are practised only in single villages. Sarez-Lake in the Bartang Valley, caused in 1911 by an earthquake and a subsequent landslide. "The one who has not been to Bartang has not been to the Pamirs at all"
… wrote the Russian travelling scholar Pavel Luknizki, who in the 1930ies fell in love with Bartang. But not just among foreigners, even among the Pamiri themselves the Bartang-Valley enjoys the reputation as being kind of the heart of the Pamirs: The place where the landscape is most dramatic, the road most dangerous, the tradition most authentic and the hospitality most cordial. Like the majority of the inhabitants of the Western Pamirs, the Bartangi also speak dialects of the family of the Indo-European, non-written Pamir languages. Religiously, they belong to the denomination of the Nizari-Ismailis, a sub-confession of Shia Islam. Nizari-Ismailis consider Aga Khan IV as the closest male descendent alive of the prophet Muhammad and as ephiphany of the divine light. His orders are absolutely binding. The Aga Khan propagates a version of Islam open to progress and to intellectual discourse with the west. His faith is practised even in the remote Bartang valley, enriched with some locally specific practices. 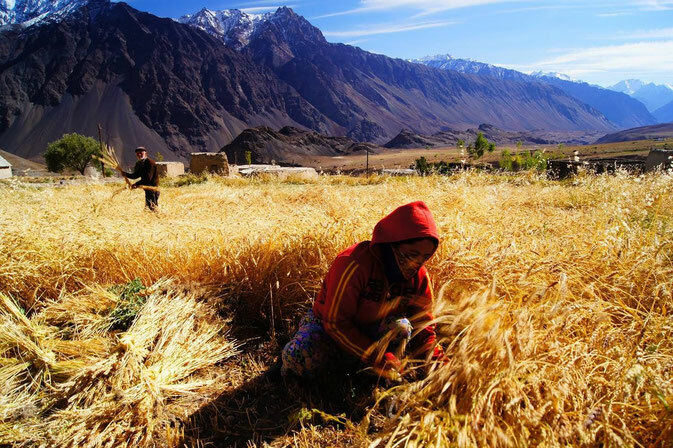 In Roshorv wheat is harvested in an altitude of up to 3200 m above sealevel! All Bartangi are subsistence farmers and pastoralists, some at the same time being employed in state service (for example as teachers) or working as drivers. As their salary is not sufficient for their livelihood, usually some family members hire themselves out as migrant workers in Russia and send remittances to the village. However, most Bartangi do not have the wish to remain in a strange place forever: In Bartang, they say, the nature is the purest, the water the cleanst and here the holy places are situated, giving their blessing to the community. Also their beloved kin is living here, and without them a family-friendly Bartangi feels like a fish without water. Often one can hear the Bartangi say: “The life in Bartang actually could be like paradise if we could just solve our electricity-problem”. Further information about Bartang you can get in the gallery.